NSSN 355: NSSN TUC Rally this Sunday – Fight together for a pay rise! Workers will be looking to the TUC Congress starting this Sunday in Brighton for a lead in taking on the brutal Tory attack on living standards. Real incomes are at 2007 levels and falling every month as price rises outstrip wage increases. Cameron notoriously claimed that we were “all in it together” when he launched his austerity offensive in 2010 but his class of super-rich have got even richer under the Tories while nurses and other workers have to go to foodbanks. But the fightback is underway. This summer has seen a wave of strikes as workers fight their way out of poverty pay and attacks on terms and conditions. 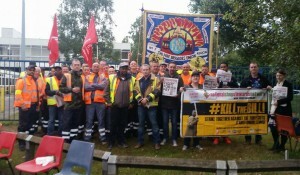 Just this Monday, we saw the Birmingham binworkers out along with fellow Unite members in Argos warehouses and historically the McDonald’s workers in the BFAWU taking action for the first time in the UK. On the same day, RMT members in three different rail companies continued their action to ensure that there is a guard on the train. 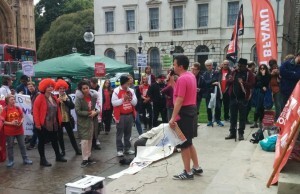 Last week, the Mixed Fleet cabin crew at British Airways paused their action after 85 days of strikes and the Barts NHS Trust cleaners, porters and domestics are due to resume their dispute next Monday on strike day 25. PCS members have been taking action to stop the closure of jobcentres and the CWU have now launched a national strike ballot in Royal Mail. These and many more are fighting out of necessity but after Jeremy Corbyn’s anti-austerity vote in the general election prevented May getting a majority, it’s not lost on workers that this is now a weak and divided Tory government and confidence is growing. There is even talk that ministers are considering ‘relaxing’ the 1% public sector pay cap. But the TUC and the unions should beware of being split into ‘deserving’ and ‘undeserving’ public sector workers – we all need a pay rise. In any case, these rumours should give us the confidence to build a real movement that can inflict a serious if not decisive defeat on the Tories and their austerity. The NSSN rally on Sunday brings together militant union leaders and John McDonnell with workers involved in the strike wave. We will be lobbying TUC Congress delegates to support the pay motions that call for the action that is needed – a national TUC-led demonstration and co-ordinated strike action across the public sector and reaching out to workers in the private sector. Come to the NSSN rally and help us build the pressure for the mass action we need to defeat the Tories. 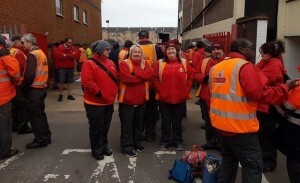 McDonalds workers strike back in Cambridge and Crayford – the NSSN was proud to support the historic strike by the BFAWU bakers union, the first in McDonalds in the UK on a global day of action by fast food workers. NSSN chair Rob Williams spoke on the Crayford picket and then again at the solidarity protest outside Parliament to give our solidarity and support to these exploited workers. Keep sending solidarity to the BFAWU, donate to the strike fund and also help the fund by buying a #McStrike t-shirt. More info on the Fast Food Rights/Hungry for Justice website. ← NSSN 354: Support #Sept4 strike day! John McDonnell to speak at Sept10 NSSN TUC Rally!